Products that are kind to the environment are a set to be a huge in 2019. And with new blinds made from recycled fabrics and sustainably-sourced products launching in the Duette® blinds range, there’s never been a better time to introduce our gorgeous blinds to homes. Our interiors expert Kirsty Hunt explains more about the rising trend for sustainable home products in 2019, as well as delving into the eco-credentials of our latest ranges. “At this time of year, there’s always lots of talk about what’s going to be hot in the world of interiors in the coming year. One key prediction for 2019 is sustainability, where homeowners will tackle interior updates with a renewed sense of environmental purpose. “Thanks to increased media attention, and of course the high-profile nature documentaries highlighting global issues, there’s more awareness about how actions on impact the environment. There’s also a growing sense of empowerment about sustainable product choices and behaviours within the home. “Products with eco/ethical credentials are certainly gaining impetus – be it that they that utilise recycled plastic waste, or that they’re produced locally with lower carbon footprints and assurances on ethical labour practices. Duette® energy-saving blinds, with their unique honeycomb structure, can help homeowners to achieve a more energy-efficient home, saving up to 25% on annual heating costs. 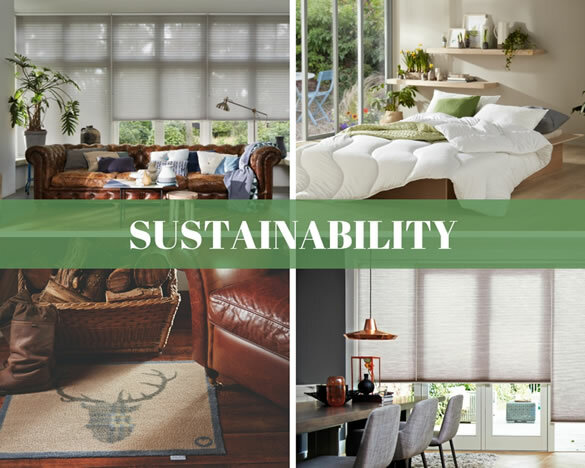 “On top of this, many of our latest product ranges are also designed support a more sustainable home and protect the environment, using eco-friendly methods and materials. Our new Duette® Eternity fabrics are made with 40% recycled polyester material helping to limit the amount of waste ending up in landfill. “And the new Bamboo fabric range incorporates 25% natural bamboo fibres from sustainable plantations. Because it grows so fast without the need for harmful fertilizers and pesticides, Bamboo is a brilliant sustainable crop. It also self-regenerates from the root so doesn’t need to be replanted. “Demand for our Duette® Architella® shades is growing rapidly, with a double honeycomb structure and even stronger energy saving properties, this proves there’s also a shift to people investing in high quality, performance products for longevity. Homeowners want to buy well and buy once to limit waste, as well as more people recycling, repurposing and upcycling existing pieces. Eco-products pictured: Hug Rug barrier mats from www.therugseller.co.uk, Eco Duvet from www.finebedding.co.uk and Duette® blinds energy saving blinds.